So I went down to Michael’s house last night to watch Treme . I fully expected to see a commemoration of Dinerral Shavers, and that is how the show began. The funeral scene was moving. Nakita Shavers, playing herself, gave a heartbreaking eulogy for her brother. I read that she had to do that scene four times. I’ve watched every episode of this damn show with a sense of detachment. Yes, it’s all very accurate. It captures some of the spirit of a time and place that I lived through, and that’s a trip. But all the same, it’s just a TV show. It’s just a story, safely trapped inside a frame of the TV set. Until last night. That crime scene, and some of the follow-up, stripped away my detachment and made me feel grief anew. I shed a few tears. Hell, after Katrina I cried most every day for a year or three, but these days my composure is not so easily shaken. 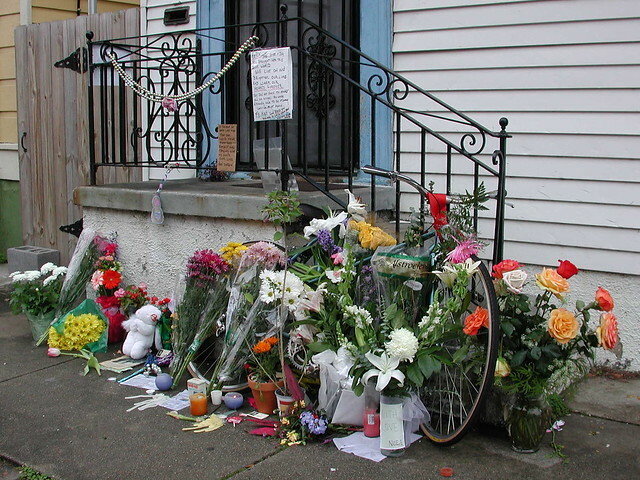 The scene showing the tributes of flowers and other offerings, piling up around the bicycle, was also fairly heartrending. It was all so damnably accurate. It stirs painful memories. But at the same time I’m glad that Helen is not forgotten. The scenes in which I was an extra, depicting the March for Survival, were very brief but inspiring. The message of unity was clear. It was fascinating to me to see how much went into the production to yield so little screen time. I was able to pick myself out in a crowd scene for one fraction of a second, but you’d have to know exactly where to look and I doubt anyone could recognize me. I was prepared to hear Nakita’s speech at the rally, since I’d heard they were going to use archival footage of her alone. Then, a strange technical glitch occurred. We think it was due to the DVR kicking in to record another program. Anyway, I didn’t see the last 60-90 seconds of the program. That was highly ironic, because I’ve since heard that I got the last word. In a way, it seems appropriate. Yes, I would have gotten a little thrill out of seeing myself on TV again, a little egotistical headrush. I’ve been on TV a lot, over the years, and I’m kind of addicted to it. But it’s a highly ambivalent feeling, too, considering the circumstances. Whatever narcissistic gratification I might derive is quickly blunted when I remember how we got here. I’d gladly trade this small fame to have my friends back whole again. I guess that goes without saying. Anyway, the ironic truncation of the episode seems almost just. I still haven’t seen it, but a friend sent me a screenshot. Life sure is a strange and sad affair. I know opinions differ about the value of such storytelling. My friend Nevitate, a New Orleanian transplanted to Los Angeles, watched this episode, his first, and texted me. Yeah, i was on the verge of tears. Strange to watch the show. So many personal events presented as ‘material’. Seems almost violative. I was put in mind of the scene from last season, where a busload of tourists gawk at a Mardi Gras Indian ceremony. I never had a problem with the “disaster tours.” I welcomed them. I figured they would help get the word out, about what happened here. That scene made me see the other side of the argument, the objection to the objectification of our sorrow. And it was so much more than an intellectual exercise. I felt that one in my gut. Ironically, Treme itself is something of a tourist bus, transforming New Orleans into a spectacle to be consumed. I understand all that, and I understand why people find it objectionable. And yet still, at the end of the day, I’m a fan. All I can say in defense of that is that we’re already well inside the spectacle economy, regardless, and that this show’s writing and (relatively) sophisticated viewership mean the essential humanity of the subject still has a chance to get communicated. I explained they may have seen this on HBO a few weeks ago. (Walking in the Tremé, talking about Treme .) Turned out there were several loyal viewers in my group, and as we talked it was clear their interest and curiosity about New Orleans was stoked by the show. I think that’s good for the city. Moreover I think good art is good for us all, and I think Treme rises to that description. Ultimately it’s still just a TV show, of course. It’s up to us to make our city vibrant and viable. That should go without saying. A TV show is no replacement for a decent economy, good educational opportunities and public safety. These three things are intimately connected, and it seems to me the writers of Treme clearly see that, and so again I think it’s all for the best. I feel they are telling our story and telling it well. Beyond all those issues, there’s the question of representing details from lives we’ve lost. Real people, not fictional characters. This is sensitive stuff, and I’m sure different people will see it differently. If Nakita’s performance was any indication, it would seem Dinerral’s family has made their peace with his story being told in this venue. I hope Helen’s family feels the same way. Post Scriptum: When I got home I found five or six loaves of really good bread in our refrigerator. I guess DJ came by and dropped them off while I was watching the show. I posted up a tweet about it. 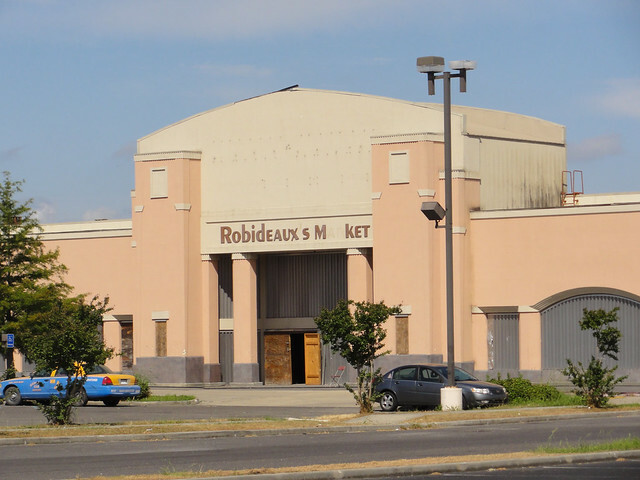 Then I started getting a barrage of marginally coherent expletive-laced mini-rants attacking Treme from a local blogger I’m not sure I’ve ever even met. I don’t have room for that kind of mess in my life, so I blocked him, or her, or whatever. Update: I was remiss not to include a link to HelenHill.org, where you can learn the latest about The Florestine Collection , Helen’s last film, now finished by her husband Paul. Were those scenes filmed at the actual house where Helen was killed? I taped it, will watch it shortly. Thank you, Bart for your love of the city and for sharing your feelings and fantastically beautiful family. Julie: I don’t know for a fact, but it sure looked like the same place. 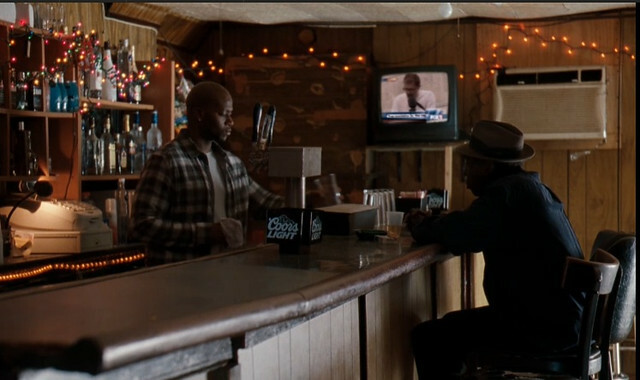 thanks for your perspectives on the series and New Orleans – pre/post k. Great catch on the bar tv still frame. I can’t take credit for the still. Wet Bank Guy sent it to me. I haven’t seen that last minute myself yet. I was in New Orleans this year for Mardi Gras, my first visit. I stayed in the Marigny and walked or biked over to the Quarter. I did some stupid tourist things, one involved Burgundy and an evening stroll. But I digress, I love the show. I was born in Halifax, NS and I live in Edmonton, Alberta. While i was researching Helen Hill, I found out she lived in Halifax and her husband is from Edmonton. Thanks for the write up on the show. The scenes of Helen’s house were intentionally filmed in a different location, but apparently the art department worked very hard to get the personal details right, in part because they try to be accurate, but also because they wanted viewers to get a sense of the loss of a person they never got to meet. The screenwriter for this episode was a friend of mine, the first woman to write for the show. It was a coincidence that she ended up being assigned this episode, and it was a challenge to work in these particular events, which were so personal, in different ways, to anyone who lived here at the time. We’ve been watching the episodes at Treme viewing parties, but this one was viewed with just a trio of friends. I was surprised at how much I was able to set aside my own memories and just watch it as an episode of the show–until the last five minutes. When the character LaDonna, a recent crime victim herself, is seen watching the march from the safety of her house, it really hit me. And when the credits rolled, I realized that it was going to be a while before I could collect myself and tell my friend what I thought. I saw several tweets about this week’s episode of Treme specifically referencing Helen Hill. It must have been powerful. I think something interesting happens when reality (the real kind, not the ‘reality tv’ kind) is adopted for entertainment purposes. My stepfather was a medic in Korea and he *hated* M.A.S.H. Viscerally. I understand that M.A.S.H. is arguably some of the best TV of its time, but I wasn’t allowed to watch it. I believe he felt violated by everything they got right and he resented everything they got wrong. And the fact that it was a comedy? That was, for him, inexcusable. So, when it comes to Treme, I can understand your ambivalence. On the one hand, it seems like it could be cathartic and validating. On the other hand, I can see where people for whom the wounds are still fresh could feel violated. In the end, I think the more people who actually understand what happened down there, the better. Delicate line that separates TV depiction and actual material of people’s lives. You put it very well. Thanks for the perspective. Finally watched this episode last night. Very powerful, really brought me back to those sad but empowering days (by empowering I mean that march–I thought they did a great job at capturing that). For my money, I think the show is hitting its stride.